When we want to make pellets we have to accept the perhaps annoying fact that we are dealing with The Nature. The natural laws within the process can either help us or prevent us from good pelleting results. 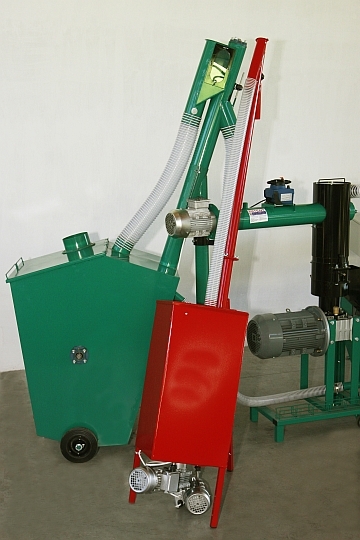 Many pellet makers have realised that a single ideal biomass does not exist. This is why additional components are widely used by large pelleting companies. Even a small amount of a component, for instance 1-5%, can make a big difference in either the look or quality of the pellet. It has got also very positive influence on the mill output. Components also enable us to make pellets from materials which are difficult to pelletize like hard wood or straw. Mixing these materials with a small amount of other biomass makes all the difference. This is why we have developed our new product - a Component Mixer which can be attached to all of our pellet mills and can be filled with the desired solid component. The result will be shiny smooth pellets which all look the same, which is what every pellet buyer expects to see and is ready to pay good money for. We always recommend our customers to purchase this Component Mixer together with our mills in order to achieve the best pellet quality results.